The Omagh businessman named as a key player in “choreographed falsehoods” presented to the Moriarty Tribunal on illegal payments to Dublin politicians had already run afoul of the legal system north of the border. The Moriarty Tribunal, which presented its 22 March report after 14 years of investigation and hearings, says Kevin Phelan was paid £150,000 to stop him making complaints that would ‘further undermine’ lies about former government minister Michael Lowry’s property deals in England. He got another £65,000 to submit a “contrived falsehood” in altered documents about deals involving business tycoon Denis O’Brien. While the Omagh man declined to appear before the Dublin tribunal when summonsed in 2007, his previous engagement with the judicial system at home went unnoticed until now. In February 2000, Belfast High Court banned Kevin Phelan from being a company director for eight years because of his ‘conduct’ as a director of Classic Home Interiors Limited. A public announcement of this High Court ruling from the Department of Enterprise, Trade and Investment (DETI) explained that Classic Home Interiors had been based at Omagh’s Gortrush Industrial Park where it sold kitchens, bathrooms and conservatories from January 1991 until December 1996. It was wound up on 29 April 1997 owing an estimated £370,256 to creditors. Within months of that bankruptcy, the then 34-year-old Phelan embarked on a new career as ‘land agent’ for disgraced minister Michael Lowry whose affairs had just come under investigation by Judge Moriarty’s tribunal on alleged bribes to prominent politicians. Lowry was the Minister for Communications who awarded the Republic’s highly lucrative second telecoms licence to Esat-Digiphone just before he resigned from the Fine Gael-Labour Coalition in November 1996 amid disclosures that Dunnes Stores had paid for extensive reconstruction work on his home in Thurles, Co. Tipperary. As Moriarty Tribunal investigations began to probe his financial affairs, Phelan bought houses in England and then transferred the deeds to Lowry. This involved an elaborate network of accounts in Ireland, London and the Isle of Man involving banks and building societies, including Crédit Suisse First Boston Bank and a credit company based in Woodchester. The initial deals for houses in Mansfield and Cheadle, for £250,000 and almost £500,000 respectively, were instigated by Mr Phelan in 1998 and 1999. According to the Moriarty Tribunal, the Omagh man’s fee for these two house purchases was £225,000, a quarter of the combined price. But there was an even bigger pay day in the offing when Phelan became involved in the £6.5 million purchase of English Football League club Doncaster Rovers by Denis O’Brien. Since beating five other contenders to secure the telecoms licence from Lowry, O’Brien had sold his Esat-Digiphone stake to British Telecom for £1.9 billion. He promptly moved residence to Portugal to avoid the Republic’s Capital Gains Tax and used the money to expand his global telecoms and media empire. Phelan sourced the Doncaster Rovers deal and drew in the tycoon because of his links with Lowry. The relationship soured before O’Brien subsequently clinched the deal through his own Isle of Man company, Westferry. Phelan’s involvement had been through Gameplan International Ltd. It was incorporated in England in August 1998, less than a year after his Omagh business was wound up and just over a year before the ban from the High Court in Belfast. Undaunted by his sidelining in the Doncaster Rovers purchase, Phelan and Gameplan were back lining out in 2002 for a deal involving another insolvent English football club, Halifax Town AFC. This deal included the lease on the club’s council-owned Shay Stadium, shared with Rugby League’s Halifax Blue Sox. Phelan, described as the agent for capital investors, was acting for Michael Lloyd from Huddersfield, then in the process of moving his Monoplas Industries business to Co. Donegal. “We will bring together a board that will represent various interests and all will bring something to the table,” Phelan promised the Halifax Courier, when he entered the tussle for control of the club and its facilities in mid-2002. He said any new owners would need to think big and he could secure a ‘seven-figure investment’. In October 2002, Gameplan announced that its consortium had acquired a majority of shares, but the deal came unstuck when Halifax Town administrator Peter O’Hara said transactions in shares for an insolvent club meant nothing. The deal died. At that point, Gameplan appears to have hung up its football boots, but Phelan remained a player in other fields, thumbing his nose at the Belfast High Court ban by registering as a director of no fewer than 22 other companies by 2008, almost all of them involved in property development in Lancshire. He also served as ‘company secretary’ for two of these companies, Diamond Property Direct Ltd and Diamond Property Sales. Most of these directorships were short-lived and by last year, 19 had been dissolved. Gameplan changed its registered company address from Bolton to Chorley in 2009 and then filed for receivership last November. By then the home address listed in its website was 2 Holmview Terrace, Omagh. Its website is still ‘under reconstruction’ and it urges visitors to contact ‘our sister company’ Grangevale Group Limited at Grangevale.com – a connection that leads directly to a website for a North Carolina retirement community. Meanwhile, Phelan’s questionable property transactions came closer to home when Planning Services issued a 2007 enforcement order for the removal of an unauthorised ‘extension’ at his home. In his appeal, Phelan received cross-party backing from SDLP councillor Pat McDonnell, UUP councillor Allan Rainey and Sinn Féin councillor Frankie Donnelly. Both Cllr McDonnell and Cllr Rainey lobbied the Planning Appeals Commission for Mr Phelan to retain the huge boundary wall at Gillygooley Road. The 65-metres long wall comprised a metre-high stone-clad wall, topped by a metre-high close-board fence. They said that the ‘extension’ to the rural property – more than four miles outside the town, was required as a deterrent because of Mr Phelan’s legitimate fears of the high level of crime in the Omagh area. But with already hard-pressed Irish taxpayers preparing to pick up the tab for a tribunal estimated at between €150 million and €250 million, Judge Moriarty has said that those who presented false evidence should be pursued for the costs. Billionaire Denis O’Brien is an obvious candidate although he has devoted more resources to attacking the tribunal – and the judiciary – head on. 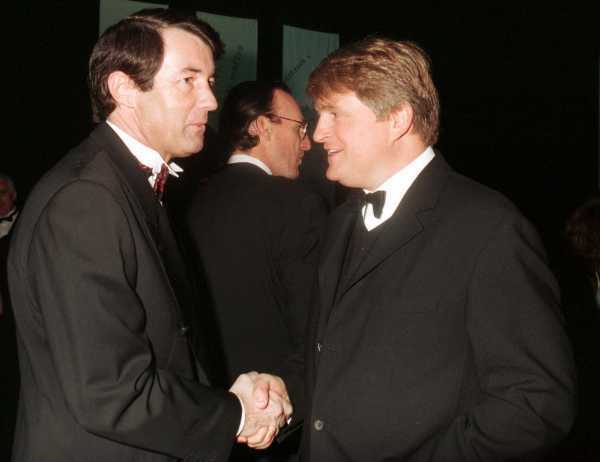 His political pal Michael Lowry continues in public life as an independent TD, having been re-elected for his Tipperary North constituency at the head of the poll last month. Kevin Phelan meanwhile has his Gillygooley wall worries. Planning Appeals Commissioner Nick Howard travelled down from Belfast for a site inspection of the crime-deterrent boundary on 14 December last. On 6 January, he published his decision ordering its demolition.